Warm elegant bridal white felted wool fall or winter wedding coat. Warm wedding coat is prefect for cold or cool weather. This merino wool jacket is suitable for fall, mild winter or spring weddings. 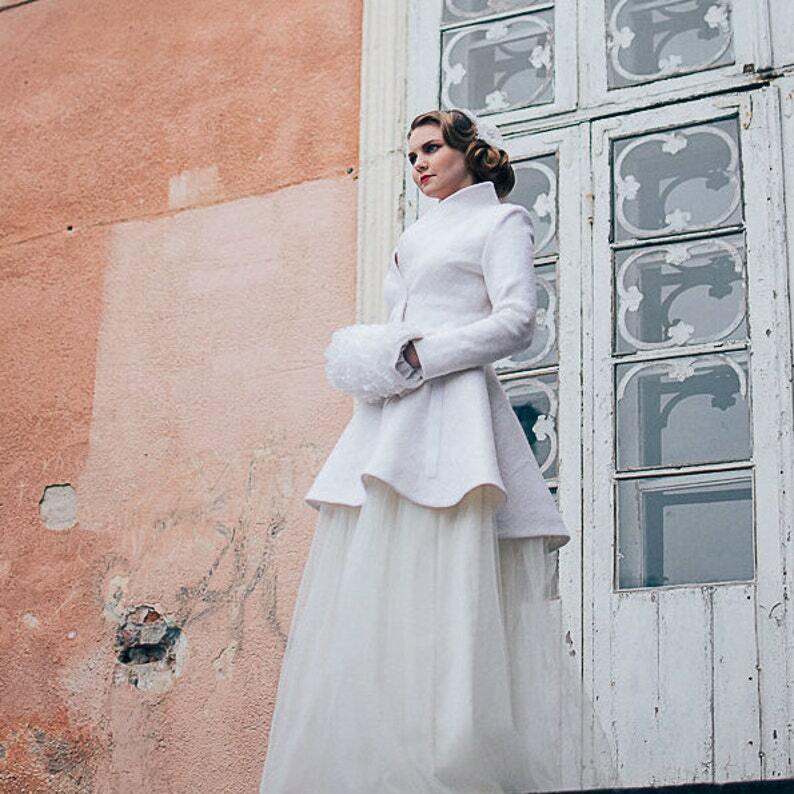 You will look the most beautiful bride in this elegant wool coat and it will keep you warm. computer monitor settings and lightening. Materials: extra fine merino wool, silk fiber, press-studs. Care: dry cleaning only. Wash with cold water 30 C / 86 F using special wool/silk detergent. Iron with steam. I love to do custom orders! Do you need different color, want to change any detail or measures, feel free to send me custom order request. Ready to ship in 15-20 days. Please check measures before purchasing - choosing by size number only, might be misleading and we both want you to look adorable on your wedding day! We highly recommend send your current measures and we will make order according to your size. Please check measures before purchasing - choosing by size number only, might be misleading and we both want you to look adorable on your wedding day! Received so many compliments during the wedding on my coat. Thank you so much. - I leave 3 days to complete the payment; if the payment is not completed in 3 days, I will cancel the sale. - Please feel free to contact me if you have any problems or questions regarding payment. - If you do not have PayPal, please to contact me, we will find resolution. - I try to do my best in describing and photographing my items accurately. Please read the descriptions carefully! -All my felt clothes are customize orders, refunds are not provided because of individual measurements, color, special details, personalization. - A cancellation might be done 24 hours of purchase. -Any refund will be made only after I receive the item back. -	Ready to ship items are shipped in 1-3 business days after the payment is received. Made to order items will be made and shipped in 4-6 weeks. In Holiday seasons, due to big amount of orders, making of custom orders can last longer. -	The shipping fee includes the handling fee as well. -	Items are shipped to your Etsy address.Please be sure to enter your " correct shipping address " for purchases. If you want to ship different address, mention in message to buyer section. -	The items to the USA should arrive in 2 – 3 weeks, to Europe in about 1 – 2 weeks, everywhere else in about 2 – 4 weeks. -	If you have not received your item after 5 weeks from the date it was shipped please kindly contact me and I am more than happy to help solve the problem. -	Please note that buyers are responsible for any and all duties and customs charges that may be incurred. I accept custom orders as well. Please contact me if you have any idea or suggestion.